Apple CEO Tim Cook last Friday was awarded 560,000 shares of Apple stock as payment for his service as Apple's CEO and Apple's strong performance under his leadership. Following the award, Cook this week sold more than 265,000 of those shares at prices ranging from $216.96 to $218.54, netting him nearly $57.8 million. The remaining 294,840 shares worth more than $63 million were withheld by Apple for taxes. As with all transactions where Apple executives sell stock, the sale was done under a Rule 10b5-1 trading plan that was adopted on May 4, 2018. The stock Cook received last week included 280,000 vested restricted stock units (RSUs) provided to him as part of his compensation as CEO and another 280,000 vested RSUs awarded because Apple achieved a higher shareholder return than at least two-thirds of other companies in the S&P from August 25, 2015 to August 24, 2018. Mr. Cook's award provides that if Apple's relative TSR performance is within the top third of the companies that remain in the S&P 500 for the entire performance period, the 280,000 performance-based RSUs vest in full. If Apple's performance is in the middle third, the RSUs will be reduced by 50%, and if Apple's performance is in the bottom third, the RSUs will be reduced to zero. Apple needed to achieve a TSR of at least 56.23% to outperform the middle third of the companies in the S&P 500 for the performance period, and at least 19.94% to outperform the bottom third of the companies. Apple's TSR for the three-year period was 89.94%, which ranked 50th of the 423 companies that were included in the S&P 500 for the entire period and placed Apple in the 88th percentile. Therefore, all 280,000 of the RSUs subject to performance requirements vested. Cook is set to receive an additional 560,000 shares each year for the next three years if he remains Apple's CEO and Apple's shareholder return continues to be among the top-third of companies in the S&P 500. Cook will also see 700,000 RSUs vest on August 24, 2021. After selling the stock that he received this year, Cook continues to own 878,425 shares, worth close to $193 million at today's closing price of $219.70. In the past, Cook has said that he plans to donate the majority of his fortune to charity. 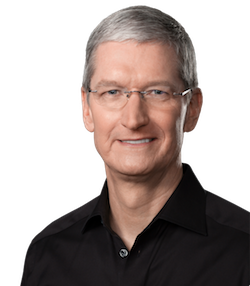 Cook last week donated almost $5 million worth of Apple stock to an unnamed charity. Almost all sales of CEO's stocks are done on a schedule to avoid them being accused of selling on information. Well, that's a few more shares than I have. Guess he'll be able to afford a house in California for a few more years with that kind of money. I am no tax accountant, but wow, does that mean that he got taxed at a rate more than 50%?? Absolutely. In California, it doesn’t take very much income to put someone into the top tax brackets. For a single person, that’s 37% federal + 13.8% state + 3.8% ObamaCare Net Investment Income Tax. Highway robbery. Following the award, Cook this week sold ('https://www.sec.gov/Archives/edgar/data/320193/000032019318000115/xslF345X03/wf-form4_153549547286956.xml') more than 265,000 of those shares at prices ranging from $216.96 to $218.54, netting him nearly $57.8 million. The remaining 294,840 shares worth more than $63 million were withheld by Apple for taxes. The typical sale of stocks in a person's portfolio is that the oldest is sold first. So, I'm sure he had 265,000 Apple share 366 days ago. This means he will be taxed at 15%. In California, it doesn’t take very much income to put someone into the top tax brackets. Don't bash California on this, the tax in this sale has nothing to do with the state the person lives in. CEOs don't just sell stocks ahead of bad news, this is illegal and covered by SEC rules now that make companies set sell-off dates in advance either as a part of a vesting program or just an up front disclosure that a year from now, they plan on selling X amount of shares no matter what the price. Looks like every year in August, Tim cook's RSUs awarded straight up on an annual basis OR performance based vest and he's allowed to sell them off. There are smart people that know more about finances than I but if I were a rich man, I'd do an annual sell-off as allowed by the SEC on a pre-set time / strike price just to cover my annual tax bill either by literally paying the feds OR donating a few million to charity as a write-off or moving them over into diversified assets like Tim Cook's trust. No. Capital gains tax on stock is 20% (over $426K 15% for us mere mortals). Income tax is what you are thinking of and it is rarely what the rich pay, but most people don't understand that and therefore support raising it to punish the rich - I mean make them pay their fair share. When that really just hits the upper middle class. Admirable he’s planning to donate the majority of his fortune. The value of those shares on the day they vested is taxed as ordinary income, just as if he had been paid that much in cash on that day. So, possible deductions and such aside, he has to pay the normal federal and California tax rates on their value. If he holds shares after they vest, gains they make after that time are taxed as capital gains. It’s the same as if he were paid cash and used that cash to buy shares. Even if he didn’t sell shares, he’d owe ordinary income taxes on the value of shares that vest. That’s why the common practice is for Apple to withhold an amount of shares (for Mr. Cook, more than 50% of the shares he’d otherwise receive) and remit a corresponding amount to taxing authorities.